My Wandering Life: Got an Umbrella? Today I hosted a bridal shower for our friend Sherry. I'm calling a moratorium on hosting showers as I've managed to host FOUR in the last year. I guess things go in cycles, and right now everyone we know seems to be getting married or having babies! The boys helped me set up and decorate, and although they knew it was a "girl" party, they were still quite proud of their work. 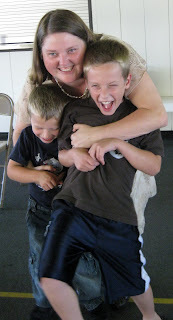 Sherry has known our boys since five moves ago when Benjamin was just six months old. The shower was bookended by two trips to the hospital to see my Uncle Jim, my Mom's only sibling, who is in the ICU and fighting for his life. My parents made the five hour trip down as well, but we missed them due to the shower. The boys were really acting up, but it's difficult to blame them as they really don't understand what is going on, only that everyone is upset and telling them to be quiet and be on their best behavior. From a kid's point of view, they really scored though! They were treated to all sorts of goodies, like frozen yogurt with Daddy and left over Bridal Shower Cake from Mommy, followed by dinner at the restaurant of their choice (they picked the one with the all-you-can-eat ice cream machine). We're expecting this to be a pretty rough week, both for us and for them. I had an Uncle Jim too... loved him... he was one of my favorite people ever... so sorry you are having a tough week... praying for you!